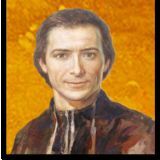 Saint Marcellin Champagnat	"A heart that knows no bounds"
that such a cure was scientifically inexplicable. One year later, on 20th February 1998, the Commission of Theologians of the Congregation for Holy Causes, recognized the cure of Brother Heriberto Weber as something preternatural and it attributed it to the intercession of Blessed Marcellin Champagnat. The Ordinary Congregation of Eminent Cardinals and Bishops expressed unanimously, on 2nd June 1998, that it was an authentic miracle, and it was decreed as such, by the Pope John Paul II, on July 3rd 1998. 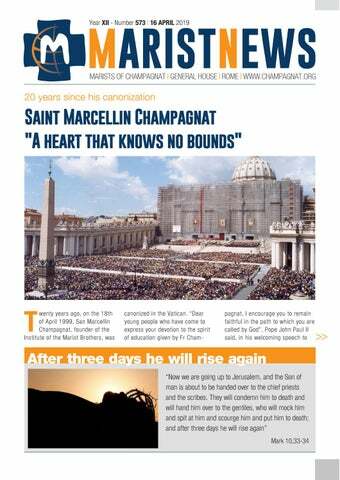 Months later, the Pontiff would determine 18th April 1999 as the date for the canonization of Marcellin Champagnat. The much sought-after day had arrived! Pope John Paul II invites us to give thanks to God “We can give thanks for the numerous disciples of Fr Champagnat who faithfully fulfilled their mission (...) I cordially grant my Apostolic Blessing to all the faithful here and to all the Marist Brothers of the world, to those who work with them in the educational field and to all the young people who benefit from their apostolate”, the Pope expressed, two decades ago, in St. Peter’s Square, when canonizing the father founder of the Marists: Blessed and Saint Marcellin Champagnat. children and young people living on the margins of life.’’ Highlights of the occasion included paper presentation, group discussion, match past, cultural dance, drama and much more. The youth thanked the Marist Brothers for organizing the event and for giving them the opportunity to interact, share and enrich one another. The event was indeed a huge success. Happy and holy Easter to all the Marists of Champagnat! May the risen Christ help us to walk as a global family. very year In the Marist Educational Centre of the community of Seoul (Korea) different activities are carried out, and many groups make use of the centre to develop their programmes: catechists of diverse parish and diocesan groups; young people belonging to parochial groups; children of catechetical groups from different parishes; groups of altar servers; students from Catholic universities who come to make retreats or some other type of programme; nursing students or professional nurses; parochial groups (Legion of Mary, Third Order of Franciscans, etc.) who come to follow a day's retreat or some other programme; groups of no-violent communication who carry out some of their programmes here; groups of postulants or novices following programmes of formation; children's and youth orchestral groups which follow seminars in preparation for concerts here; associations that follow several days of diet to promote health and to fight obesity; reading seminars for children; seminars for support groups and unions of diverse types, and so on. The activities and the groups using our centre are truly very varied and of all sizes, from groups of just some 10 people to others of 150. The busiest months provide for groups during the schools vacations (December-January-February and July-August). During other months of the year, the activities diminish and tend to take place on the weekends (Thursday or Friday to Sunday). As the Centre has 3 floors and several large rooms for meetings, when the size of the groups allows it, several groups use the building simultaneously without any problem. This allows the approximate number of people who make use of the Centre in one year to reach around 7000. Each group is different, and there are also different programmes varying in duration, from 1 to 6 days. This entire activity is the responsibility of two Brothers, Timothy Song and Dรกmaso Jeon who not only welcome and assist, but on occasions, direct these groups. They also look after the cleaning and maintenance of the place. And when it is necessary, some other Brothers residing in Seoul help with the maintenance of the Centre. marist news 573 ■ Easter in Spain 3,000 teenagers and young people will participate in the Easter meetings organized by the Marist of Champagnat and Pastoral Teams. More than 30 different places will host the celebrations that help to live the most important event of Christianity: the Passion, Death and Resurrection of Jesus Christ. ■ District of Asia In March, the brothers in VN, with Br. Juan Castro and lay Marist had the country meeting in Lam Dong province. During the Eucharist celebration Br. Bao and Br.Thuan renewed their religious vows for one year. ■ Brasil Sul-Amazônia On April 11th, a group of 22 Marist Brothers participated in the Course of Certification for the Promotion and Protection of the Rights of Children and Adolescents in Porto Alegre. It is the beginning of a project that aims to train the Marists of Champagnat to dedicate themselves more and more to the integral protection of children and adolescents. ■ United States This summer the Province will be opening a Community of Welcome in Austin, Texas. The community is being established primarily to offer young adults and Brothers the opportunity to share our life of prayer, community, and service. The community is not envisioned as a formation or discernment community (though both may take place). Five young adults have committed to being part of the first community. Each of them has participated in a Vocation Pilgrimage/Come and See Experience and so are familiar with the Marist Brothers and our community-life. in the future with the school. Present at the event there were around 200 people, amongst whom Brothers of the community of Baucau, representatives of several religious congregations, the vice director of the Catholic Institute for the Formation of Professors (ICFP) The inauguration of the new formation house is a great achievement for the Brothers of Baucau and for the province in general. The twelve candidates for the Marist religious life who began their postulantship in March, are the first ones to carry out their religious formation in this house. Until now, the candidates were in a rented house. This new house is designed to welcome up to 22 applicants and it will be of great benefit for the coming years. On April 7, in Sri Lanka, the first three Brothers of East Timormade their profession. The fifth call of the XXII General Chapter asks “awaken in ourselves and those around us an ecological awareness that engages us in caring for ‘our common home’”, in response to emerging needs. During his reflection for Lent, Pope Francis expresses that “when we fail to live as children of God, we often behave in a destructive way towards our neighbours and other creatures. Intemperance then takes the upper hand: we start to live a life that exceeds those limits imposed by our human condition and nature itself”. What’s our answer? ■ South Asia Marist Lay members and their families in Sri Lanka had their Annual tour from April 6th to 8th. Brother Michael shared the Pope’s views on ecology and spirituality with the group. The group discuss how they might become a nature loving group. ■ District Pacific Kiribati is one of the most remote countries in the world, yet the beaches of South Tarawa are covered in litter due to an overcrowded population and poor waste management. The Marists recently organised a beach clean up to beautify the area and improve knowledge about the impact of waste on the environment. ■ Canada From 8 to 10 March, “Chad 2019” was held at the Marist camp at Lake Morgan in Rawdon: a meeting to reflect on climate change and the environment. Under the motto “make your voice heard”. Participants from Laval University and Marcellin-Champagnat High School met for a weekend to share their concerns about climate change. ■ Spain The Centro Santa María Maristas Toledo was the school that won the most prizes in the annual competition on the care and responsible use of water, which was held on 21 March at the San Marcos Museum, organised by the Toledo water company, Tagus, in collaboration with the city council. The 5th and 6th grade Primary Ed students received 4 medals and 14 diplomas.